©2011 & TM Julia Donaldson/Axel Scheffler. Secondary Target: The Highway Rat has become a firm favourite with the whole family. These are the official The Highway Rat licensed characters, The Highway Rat. The Highway Rat is ravenous as he gallops along the highway stealing food from the other animals. He craves sweet, sugary treats, pinching clover from a rabbit, nuts from a squirrel and even take his own horses hay! Until he runs into a crafty duck and gets his just deserts! 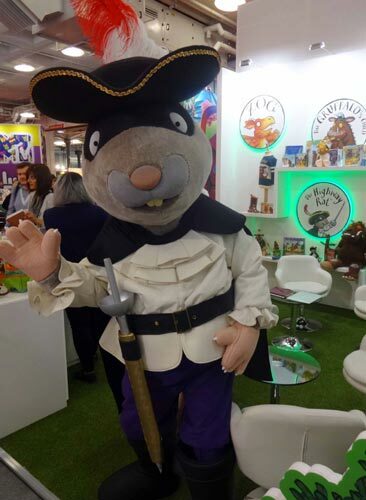 From the creators of The Gruffalo, The Highway Rat book is the latest journey into the world of Julia Donaldson and Axel Scheffler and takes us on a swashbuckling tale of bandits and biscuits. The Highway Rat film premiered in the UK on BBC One on Christmas Day in 2017. The animation is directed by Jeroen Jaspaert, director of award-winning production Stick Man. The animation features the voices of David Tennant, Rob Brydon, Frances de la Tour and Tom Hollander.